One of the newer Smoke bush varieties,Cotinus coggygria ‘Young Lady’ not only has the wonderful plume like flowers that rise above the foliage in summer, it also has good autumn foliage. Of all of the Cotinus cultivars Cotinus coggygria ‘Young Lady’ is also the most floriforous we have seen. Masses of flowers in summer this is a relatively new release and we think Cotinus coggygria ‘Young Lady’ is a wonderful plant. 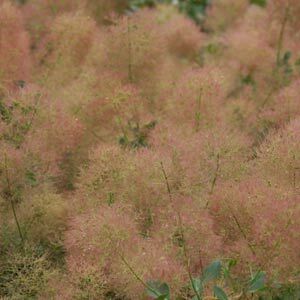 Reaching around 2-3 m Cotinus coggygria ‘Young Lady’ is a plant grown for the flowers as well as the autumn foliage. The flowers rise above the green foliage in summer however it is actually the spent flower heads are the real show, the explode into fuzzy ball that will actually cover the whole plant. A smokey pink cloud seems to hover over the plant. And Cotinus coggygria ‘Young Lady’ will flower from an early age. Autumn foliage is orange to red. You could use this as a specimen plant, in the garden border an informal hedge or even grow it in a pot or container. Care is minimal, you can prune back in spring to maintain shape and size. Remember that this is a smaller cultivar so pruning is generally to a problem. If you must cut back by 1/3. An all purpose slow release fertiliser in spring seems to be adequate.